Your fantasies of giving birth may be very different from the reality. Like these women’s, your expectations of childbirth may be vastly different from the reality. According to a USA Today poll conducted last year, 36 percent of women surveyed found that delivering their first child was harder than expected, 31 percent said it was easier, and 13 percent said they hadn’t known what to expect. Only 1 in 5 women had a childbirth experience that was in line with what they had anticipated. 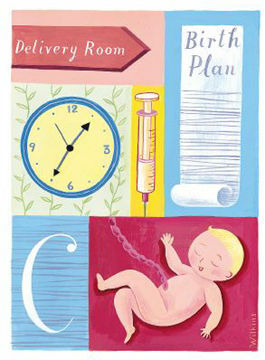 Knowing in advance what labor and delivery will be like and how you’ll respond is understandably difficult. “Childbirth is not part of the culture,” explains Marion McCartney, a certified nurse-midwife and director of professional services at the American College of Nurse-Midwives in Washington, D.C. “We’ve removed it from the family experience, so many women have never seen it and don’t really know what to expect,” she says. “Women’s only experiences of childbirth come from what their friends tell them, which tend to be horror stories; or from what they see on TV or in the movies, where it is portrayed as painful and dangerous.” In addition, accurately describing what labor feels like to someone who’s never been through it is very difficult. But while predicting your pain tolerance is hard — not to mention the length of your labor and the size of your baby, all factors that can affect the experience — childbirth is fairly predictable. In fact, about 85 percent of deliveries are perfectly normal, says McCartney. When there are problems, most of the time women and their doctors know about them in advance and can prepare for them. What will help get your expectations as close as possible to reality is education. Don’t listen to horror stories. Instead, take childbirth classes and read medically factual books on birthing. Also ask your doctor or midwife about the trends in her practice — what percentage of her patients have epidurals, episiotomies or Cesarean sections; how many walk around during labor — any possible variable that concerns you. Unless you have special medical considerations, you probably can expect your childbirth experience to fall in line with the majority of those in your doctor or midwife’s practice. Next, think about and write out a birth plan, including what you would like to be able to do during labor, such as walk around or soak in a warm tub. Discuss your plan in advance with your doctor or midwife, bring it to the hospital, and make sure your husband or birthing coach knows your wishes so he can advocate for you when you’re in labor. Just don’t get so married to your birth plan that you become inflexible or allow your or your baby’s safety to be jeopardized if things don’t go as intended. Your contractions may slow down and you may need to have labor sped up with Pitocin, for example. Or your doctor might feel that you should have an emergency Cesarean section. In such cases, she must have the last word. And if your labor doesn’t go the way you had hoped, try to accept it without feeling that you’ve somehow failed. If you give birth to a healthy baby, you’ve succeeded.